A novel bidirectional dc–dc converter is presented in this paper and its circuit configuration of the proposed converter is very simple. The proposed converter employs a coupled induct-or with same winding turns in the primary and secondary sides. 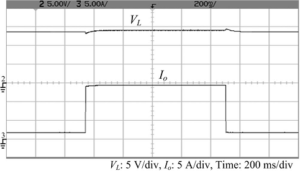 In step-up mode, the primary and secondary winding s of the coupled induct-or are operated in parallel charge and series discharge to achieve high step-up voltage gain. In step-down mode, the primary and secondary winding s of the coupled induct-or are operated in series charge and parallel discharge to achieve high step-down voltage gain. Thus, the proposed converter has higher step-up and step-down voltage gains than the conventional bidirectional dc–dc boost/buck converter. Under same electric specifications for the proposed converter and the conventional bidirectional boost/buck converter, the average value of the switch current in the proposed converter is less than the conventional bidirectional boost/buck converter. The operating principle and steady-state analysis are discussed in detail. Finally, a 14/42-V prototype circuit is implemented to verify the performance for the automobile dual-battery system. Fig. 1. Proposed bidirectional dc–dc converter. Fig. 2. Some experimental wave-forms of the proposed converter in step-up mode. (a) iL1, iL2, and iL, (b) iS1, iS2, and iS3. (c) vDS1, vDS2, and vDS3. Fig. 3. 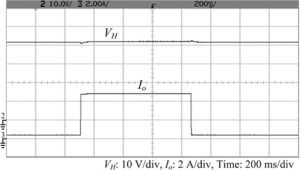 Dynamic response of the proposed converter in step-up mode for the output power variation between 20 and 200 W.
Fig. 4. Some experimental wave-forms of the proposed converter in step down mode. (a) iLL, iL1, and iL2, (b) iS3, iS1, and iS2. (c) vDS3, vDS1, and vDS2. Fig. 5. 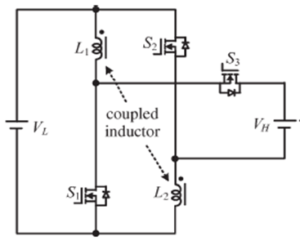 Dynamic response of the proposed converter in step-down mode for the output power variation between 20 and 200 W.
This paper researches a novel bidirectional dc–dc converter. The circuit configuration of the proposed converter is very simple. The proposed converter has higher step-up and step-down voltage gains and lower average value of the switch current than the conventional bidirectional boost/buck converter. From the experimental results, it is see that the experimental wave-forms agree with the operating principle and steady-state analysis. At full-load condition, the measured efficiency is 92.7% in step-up mode and is 93.7% in step-down mode. Also, the measured efficiency is around 92.7%–96.2% in step-up mode and is around 93.7%–96.7% in step-down mode, which are higher than the conventional bidirectional boost/buck converter. M. B. Cam a r a, H. G u a lo us, F. Gust in, A. Berth on, and B. 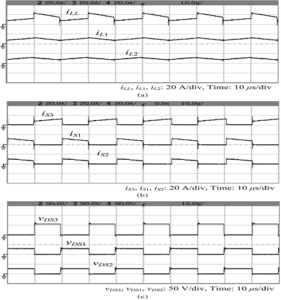 D a k yo, “DC/DC converter design for super capacitor and battery power management in hybrid vehicle applications—Polynomial control strategy,” IEEE Trans. Ind. Electron., vol. 57, no. 2, pp. 587–597, Feb. 2010. 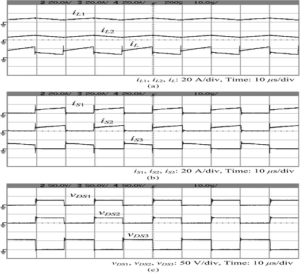 T. B h at t a char ya, V. S. G i r i, K. Mathew, and L. U man and, “Multi phase bidirectional fly back converter topology for hybrid electric vehicles,” IEEE Trans. Ind. Electron., vol. 56, no. 1, pp. 78–84, Jan. 2009. Z. Am j ad i and S. S. Williamson, “A novel control technique for a switched-capacitor-converter-based hybrid electric vehicle energy storage system,” IEEE Trans. Ind. Electron., vol. 57, no. 3, pp. 926–934, Mar. 2010. F. Z. Pen g, F. Zhang, and Z. Q i an, “A magnetic-less dc–dc converter for dual-voltage automotive systems,” IEEE Trans. Ind. App l., vol. 39, no. 2, pp. 511–518, Mar./Apr. 2003. A. Na sir i, Z. N i e, S. B. Be k i a r o v, and A. E mad i, “An on-line UPS system with power factor correction and electric isolation using BI F RED converter,” IEEE Trans. Ind. Electron., vol. 55, no. 2, pp. 722–730, Feb. 2008. This entry was posted in Blog, scribd, slideshare, website and tagged Analysis and Implementation of a Novel Bidirectional DC–DC Converter, Bidirectional dc–dc converter, coupled inductor. Bookmark the permalink.